How best to find the "best" small solar panel of a particular size? Given that the advertised milliwatt rating of solar panels is hardly a reliable indicator (especially if the seller is on aliexpress or ebay or the like), what's a fair way to compare them? One could infer something about their relative power by measuring voltage and current under load (since dc power = voltage * current), but which load exactly? Or does it even matter? For instance, I have one small panel that, unloaded, appears to produce about 3.6v at a given light intensity, whereas the other (of equal surface area) produces 5v under the same conditions. As it turns out, the 3.6v one does a much better job of charging an ultracap with my solar harvester (https://forum.mysensors.org/topic/5274/powering-mote-24-7-using-only-a-supercap-and-solar/143), but I'm not sure if that's because it's 3.6v output instead of 5v (and each measures differently under load anyway). or because the panel is in some other way "better". The choice would be simple if I were only choosing between the two, but since I'm trying to optimize the panel chosen, I can choose from other units also on the market. Therefore, I'm trying to be smart, rather than random, about picking other panels to test before purchasing them. Out of the panels I've tried, everything rated at 5.5v or thereabouts has worked, including on overcast days. That's important to me, because I don't want to assume direct sunlight. I have ordered a few boost buck converters that can output 3.3v with input from 0.9 to 6v. Let's see how they do with a couple of supercaps and a small solar panel. I've found that with a 5.5v panel of virtually any size, I haven't needed boosting in any room that has a window in it--even if the panel is pointed away from the window! To do a rough-and-ready site survey, try the blue LED test using a 5.5v panel and walk around your house with it . I think you'll be pleasantly surprised! Also, you don't technically even need a supercap. I find that I can power-up an atmega328p and send two packets from an RFM69W using a mere 100uF capacitor charged to 3 volts. With most solar panels, such a capacitor will charge up almost instantly. I think with some adjustments to my setup I can do the same using an even smaller capacitor if I wanted to. I want to make a small weather station so I want to be sure to have enough juice for the night as I increase the number of sensors. I found some cheap 2.7v 100F that cost as much as a 5V 4F, so I think I can have enough stored energy for a while. That should be plenty. I have a node that wakes up every 100ms and listens for 1ms each time to see if another node is trying to contact it. It also updates the gateway with its cap voltage level every 5 minutes. So, on average it's probably busier than your weather station. It can do all that for 24 hours on less than 5F charged to 2.7v. So, with 100F, you should have plenty of margin. Are you still using your solar Harvester to control the supercap charge? I am going to use a 5v panel so I'll have to use 2 supercaps in series and a diode. You mean the BQ25504? I dropped that quite a while ago. It was rather expensive in the first place, but it was also miserably hard to solder. One of the simplest circuits is just LDO plus diode plus one 2.7v supercap. What LDO did you use? However, if you're going to be ordering new parts, I suggest you wait a bit. I'll be posting a better circuit after I receive and test the pcb. The best deal I've seen is 10F supercaps on Digikey for $2 each, which would be good enough for most applications. The good news is that the pricing on supercaps is favorably non-linear. By that I mean you can, for example, purchase a good 400F supercap from Digikey for around $12, not $80. Which buck-boost converters did you buy? Well, the chart in the description foretells of a problem you're likely to encounter: to get 50ma of 5v output, you need to provide it with 260ma current at 1.2v. I don't know your setup, but I'm guessing your solar panel won't be delivering that. Will it scale to the available current, or just fail entirely? Who knows, because there is no datasheet. Of course, at 3.3v, it won't require as much current, but still.... you might want to look into that. of course, but I am counting for the supercap to supply the power and the solar panel to charge it during the day. With 2 100F supercaps voltage should never reach that low level within one night. I found the 3.3V version. The values in the table are just for reference, so you need to scale it down to the power required for an arduino pro mini and few sensors. I could also very well be that I may only need a voltage regulator to 3.3V because the voltage from the 2 caps would never drop below that. Because there are so many different solutions that work, it's a fun problem to compare notes on. Seems better than anything I see on AliExpress. Also, do you have any particular reason you want to boost to 3.3v? If not, then if using an RFM69W, it would be more efficient to boost to a lower voltage, like maybe 2v. Not really, it's just the standard voltage for Arduino, radio modules and sensors. I did look at that project, but smd is still unknown to me. The one from aliexpress is only step up, the other it's interesting but I don't need the variable output voltage since pretty much everything runs at 3.3v. Good luck with it then. Let us know how it works out for you. @gohan I think you may run into a problem with your step-up design. From a cold-start with dim light, very likely the step-up will drain current from your buffer capacitor faster than it's being added, and it will just spin its wheels and produce no usable output. Please do let me know if that's NOT what happens or if you have a design which avoids that happening. I thought about that too, that's why I choose to use big capacitors, so that voltage would never go that low. and measured the open circuit voltage of each under the same deliberately dim ambient room light. Each had a different open circuit voltage: 3.2v, 2.7v, 2.5v, and 2.2v. That's quite a spread in performance! I'm not sure what accounts for the difference, but you can't really guess just by looking at them which would be better or worse. So, really, there's no way to predict from the advertising alone what you're going to get. what did you expect from the quality checks in China? Well, to be honest, what I expected was that they would all be roughly the same, but probably far short of what was claimed. Where are your solar cells made? China, right? How are you dealing with the variation in what you get? I could buy solar cells from Digikey that are much more uniform, but they'd probably cost 6-10x as much. So, should I just buy more than I need from China and bin them myself? Or should I change the design to assume the worst of the possible range? Or buy from a seller with a better reputation? I think I'll try the later first. Interestingly, in direct sunlight they all measure at an open circuit voltage of 7v +- 0.1v. So, go figure as to why the range is so much wider under dim conditions. @NeverDie couldn't the variations be due to small changes in lighting when you tested? @mfalkvidd I doubt it. I measured it more than once, and it was repeatable. Anyhow, I'm going to string a number of these cheap panels in series and see if I can power a mote off of mere moonlight. I think it will probably work, which would be pretty cool. @NeverDie Interesting. Let us know what result you get. Will do. Have you found a good source for mini/micro solar panels? Not being confident about what I would actually get, to date my purchases have been somewhat random. I think the Solar Bit would probably be excellent for moonlight powered motes, if only because their combined size would still be small enough so as not to be awkward. Of course, being powered by moonbeams is an artificial objective. What it would really mean is that your mote could probably be powered just about anywhere that's not completely sealed off from light. Any indoor living space that's not a closet would probably get enough light. @NeverDie I bought my first two over a year ago. Have not used them yet. So no, nothing useful unfortunately. It's a pity this topic hasn't attracted more interest. I guess people are happy with their batteries. There seems to be a sweet spot at 6V 1W when it comes to price/performance, at least specified performance. Smaller panels are relatively expensive, and so are larger. I have ordered four of these but they haven't arrived yet. I have been looking for flexible panels, something that could be folded or rolled up, but haven't found anything with a decent price so far. Do you have a link to the podcast? Never before heard of a paint that produces solar power. Is it something I can buy? I just now tried four 6v panels powered in series by moonlight just to see what would happen, and it produced only 0.06v. So, scratch that idea. @NeverDie ths is slightly off topic, but can you recommend any rectifier with low drop voltage to use to prevent the solar panel from discharging the supercap/battery? I'm not comfortable with SMD, so I need to find something that's big enough to hand solder, has low drop and doesn't cost too much. @NeverDie I have to look at it but it's in Italian and the paint it wasn't just simple paint, but different layers of semiconductor materials printed on the case, so something quite difficult to do at home. @mfalkvidd I usually seen schottky diodes on the solar panel for that purpose. Not sure about through-hole blocking diodes. I'm using 1PS79SB30, which is SMD, but reverse current leakage is just 10na. Practically all the new good stuff is SMD, so you're severely impaired if you don't make the jump to SMD. SMD is nothing to be afraid of. Presently I'm hand soldering everything, including all SMD parts. @NeverDie thanks. How do you handle lead times för pcb manifacturing? 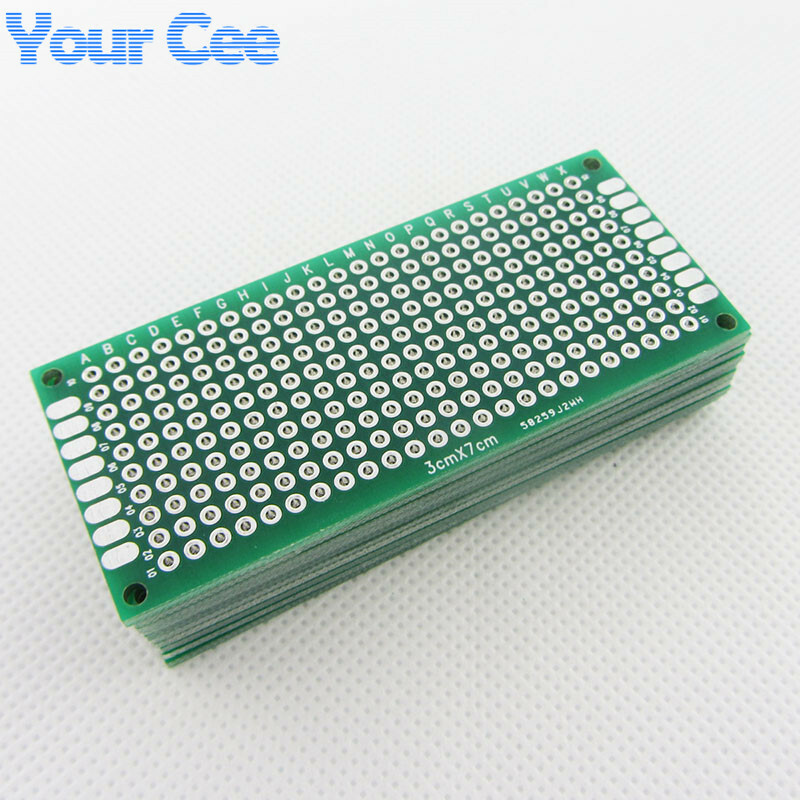 Or is it possible to buy prototype pcb cards? I'm worried project lead times will 10x if I need to wait for pcb milling for each iteration. Then I literally plug the SMD part into the protoboard. I then solder wired connections among the various parts. Sometimes I'll use breadboards, but I prefer this method because the wiring on breadboards can get rather loose, which becomes a headache, whereas doing soldered wire connections on protoboard, the connections are great quality and "made" forever until you decide to change them. I do it this way first rather than going straight to PCB because of the long PCB fab time (on average around 2 weeks for me from OSH PARK). Once I verify the design is correct using the protoboard, then I'll translate it to PCB as the final step. Also, while I'm waiting for the PCB to arrive, I have a solid working prototype, so I can continue working on whatever is next and the turnaround time for PCB fabrication isn't quite so painful. @NeverDie it answers my question completely. Great stuff. Thanks a lot! However, they're disappointing. They do produce 5v if put into direct sunlight. However, indoors, they produce maybe 1/3 the open-circuit volts of a larger mini panel. Instead, I had expected it would produce the same open circuit voltage, but simply able to produce less current. So, I think what may be going on is that these panels may have some kind of internal leakage. In direct sunlight, that leakage is relatively small. However, in the less good mini solar panels, that internal leakage starts to dominate as lighting conditions get dimmer. I've tested even smaller mini solar panels from Digikey, and they do manage to produce much more voltage under dimmer lighting than these cheap ones from China, which I'm now doubting will be of much use to me. @NeverDie too bad. Thanks for sharing your findings. I just completed a battery-free outdoor node reporting temp/humid based on the information in this thread. Works great, thanks to @NeverDie for his insights. Node is a sensebender micro, RFM69W, 10F supercapacitor, and 5V solar panel. Reporting every 4 minutes it sends temp, humid, supercap %, & solar V. Uses the simple tiny solar charger schematic from @NeverDie shown above. Results: The supercapacitor cost $2 at Digikey, is about 2/3 the size of a AAA battery, and lasts 40 hours without the solar panel connected. The 40 hours is when the supercapacitor reaches 1.9v as the low end for operating the node. Easily gets through the longer dark winter nights. The solar panel is from China, Ebay, 110mmx70mm, 5V, 1.25W. The panel works great also. It reaches 4V in the smallest amount of light, and 5.45V (no load) in modest indirect light. In fact, it will fully recharge the supercapacitor in the morning before the sun even rises above the horizon, just from the sky brightening. (From the ~20% overnight discharged state.) It seems to charge a fully empty supercap in ~10 minutes under average light. Bottom line: no longer walking through 1ft of snow in 10 degrees (F) to get the node, bring it inside, remove water seals, and change the batteries. This is the solution I was looking for. Also have a 2nd outside node in testing using the Ceech solar board (A great PCB also! ), a 18650 battery and the same solar panel. So far the battery has gone 2 months and is at 3.85V without the panel connected. In testing, the solar panel has no problem charging the battery. In fact so much, I am going to add a FET to disconnect the solar panel periodically to allow the battery to cycle some. This site is excellent, such great talent, thank you all! Cool! That's great info. Thanks for sharing your findings. @novicit Could you share schematic and software of your node? @novicit if you could make the battery work between 20% and 80% it will help the battery life. I'm not aware of any advantages to cycling a LiPo battery. As mentioned by Gohan, though, charging to just 80% does seem to extend lifespan. Better yet, use a LiFeP04 battery. They're safer, and you don't need to down convert their voltage because their max charge is 3.6v. I prefer supercaps mainly because they should last practically forever. @NeverDie Did you look at @ceech solar harvesting boards? My experience with solar panels is this. There are so many of them with the claiming same spec,. but behaving differently in real life. I think the same reason is quality. I have a weather station using ceech's board with temp/hum/baro/lightning/light sensors and nrf24l01+, 5V 1.2W solar panel and 3.7v 400mA LiPO. This has been running for some time. I was actually surprised that the battery is being charged even on a dark winter day. Some harvesting even is possible without the sun. Now I have been looking at replacing LiPO with a solar harvesting board and a few supercaps. Do you think 10F would be enough? Or shall I go for something higher like 20F or 50F? @NeverDie were they all at the same angle to the light source? If you laid them out on a table and shone a lamp, theynwill be at different angles and have different results. @wallyllama I would say that in the similar circumstances different solar panels do behave differently due to quality solar cells, i.e. manufacturing quality as well as efficiency. which I may order just for fun. Impossible for me to really answer your question, as it all depends on what your current drains are. A 10F supercap isn't really much compared to a 400mah Lipo. @NeverDie OK, I have a low powered board based on ceech 328p (pro mini footprint) board with a few sensors and nrf24l01+. LiPO 400mA is an overkill - the battery almost never goes below 4V. I just have a spare one from my RPi3 UPS (UPS Plco). So, it's for the case of having a solar panel that produces more volts than the target device can handle. It's a larger solar panel than the ones we've been discussing. @gohan can you ask what is it you are trying to use supercapacitors for? Which board? What's your sleep / TX consumption? It depends on how you want to handle the charge termination. If all you want to do is use a blocking diode, as in the sparkfun schematic, then yes. However, remember that if you put two capacitors in series, they have half the capacitance. Furthermore, if you do charge them to 5v, you'll have to step down that voltage one way or another, or else you'll fry the radio on your node. That's why I've gone the direction of using a larger supercap, but terminating the charge when it gets near its rated limit. Yes, you can buy supercaps that are rated up to 5.5v, but they're relatively expensive compared to the 2.7v rated ones. Well, yes and no. I think the challenging case is how to make it as small as possible but still low cost and fairly simple. That way, if you have a sensor that needs to be powered at 3.3v, or the voltage on the supercap has fallen below 1.8v, you turn on the boost converter, but only for as long as it's needed. All the other times, you leave it turned off and running your node directly from the supercap voltage, because boost converters are generally quite inefficient. @gohan perhaps I misunderstood you - why do you need 5V caps? Automatic cell balancing prevents overvoltage damage to either supercapacitor while maximizing charge rate. @gohan Did you see this? @ceech is selling a few interesting solar harvesting boards. I'm not sure how they price these chips, but it seems like they price themselves out of much of the market to the point where they become almost like novelty items. BTW, I like what I can see in Ceech's boards, and I think they're fairly priced considering the cost of the components. I'm just trying to be objective about this. Likewise, I don't understand by the LTC3525D-3.3 (above) is about 4.5x the price of the MCP1642D-33 (also above), especially when the latter chip actually appears to be superior, at least on paper. Am I missing something? I went ahead and made the switch on the node that I'm experimenting with: I'm now using a LTC3235D 3.3v passthrough boost converter. I switch it on when the node wakes up, do various measurements, then switch it off before transmitting the results if the supercap voltage is above threshold. Everything working smoothly. because it's the only one I have on hand. If it seems to help, then I'll look for something more on-point (and less expensive!). That said, the panasonic solar panels (which are even smaller!) are about 4x their voltage (i.e. about 16x the 53mmx30mm ones) under the same dim lighting. So, regarding the OP: yes, there are definitely quality differences that express themselves in dim lighting, and this is proof. @NeverDie Interesting find. Could you post the product links instead of the order links? Order links can't be visited without being logged in as the user who made the order. I can't post a link now to the good ones, because it looks as though they are no longer being sold. I had posted links before that worked. Believe me, no one is sorrier about this than me, because I want to order more of them. I just today started using a smart diode between the solar panel and the supercap. Voltage drop across it is a mere 0.03v, so I assume that means more power is faster transfered from the panel into the supercap. It better approximates an "ideal diode" than an actual diode does. So, it behaves like a diode, but the voltage drop is much less. I measured the reverse current leakage on it, and it's about 1ua, which is higher than some of the best diodes, but not bad. which I've also tried. However, it has a bigger voltage drop, so I don't like it as much. Also, TI's chip is more expensive. It may not show so well in the photo, but what I think may be key is that it wasn't pieced together out of scrap solar cell fragments (like the "bad" one was) but rather appears to be a single piece. So, that may be a clue on what to look for in the future. Do those solar panels handle outdoor weather?